In vain is a progressive rock band from Sweden. At the time for this demo the band consisted of the brothers Robert (bass) and Patric Tindvall (lead, rythm & acoustic guitars), Magnus Christiansson (vocals), Daniel Karlsson (drums) and Johan Hasselblom (lead & rythm guitar). 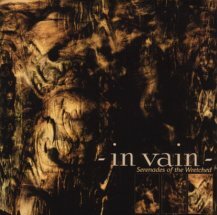 In vain was formed in November'98 for one gig only. The gig turned out very well and they decided to continue on as a band. At first, the music they played was slow doom metal. In vain developed fast and the first singer Patrik Wikström then left since a cleaner voice was required. In the year of 2000, they came into contact with Magnus Christiansson who first was asked to do the vocals only on the song Wretched will. They were all very pleased with the result so Magnus became the new singer of the band! This demo, "Serenades of the wretched" is their first and it was released in November 2001. It features 6 tracks. Robert the older brother, writes most of the lyrics with a little support from Magnus. Patric is the one who writes practically all the music. The sound of In vain is very straight and clean without being simple at all. It's progressive rock in it's true shape! By listening to this demo, my thoughts often wanders off towards the new "Damnation" from Opeth. In my opinion, that's a very positive comparison. This demo is a very interesting one and all the six songs has got great potential! I'm especially fond of the songs All for Nothing, which is performed with anger and a lot of power in both the instruments and vocals, and No sign of Yesterpride with a very catchy tune that gets in your head right away. The biggest strength of this demo is all the very good and catchy melodies. They seem all to be so well thought through and together with the dark and melancolic lyrics, it turns out very good as a whole. It's weakness is the arrangements that could have been more professional and the sometimes tame vocals. All in all though, this is a demo definitely worth checking out! The future looks very promising. Nowadays, In vain is: Robert, Patric, Magnus and Daniel since Johan has left the group. They are currently writing new material and has now got 10 more or less finished songs which will eventually be sent to record companies over the world. I'm really looking forward to hear the new stuff from this band for which I believe the breakthrough is soon to come!